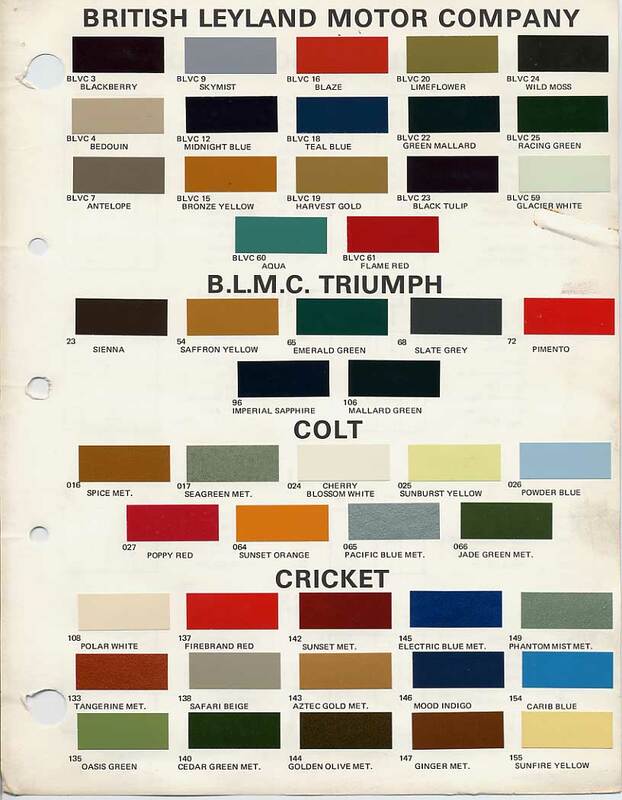 Scans of paint chip samples for BMC (later British Leyland) car colours from 1964 to 1978, with names and paint codes for various British makes and models, such as MG MGB & Midget, Triumph Spitfire & TR6, Austin, Austin-Healey Sprite, 100 & 3000, Morris Minor, Riley, Wolseley, Colt, and Cricket. Due to differences in scanners and the way monitors display colours on your screen, these paint chips should be a rough guide only, as the reproduction will not be accurate without a complex monitor calibration process. If you're looking for a new color for your car, the best way to preview the result is to go to a local car show (check the Event Calendar on this site) and see them in person. 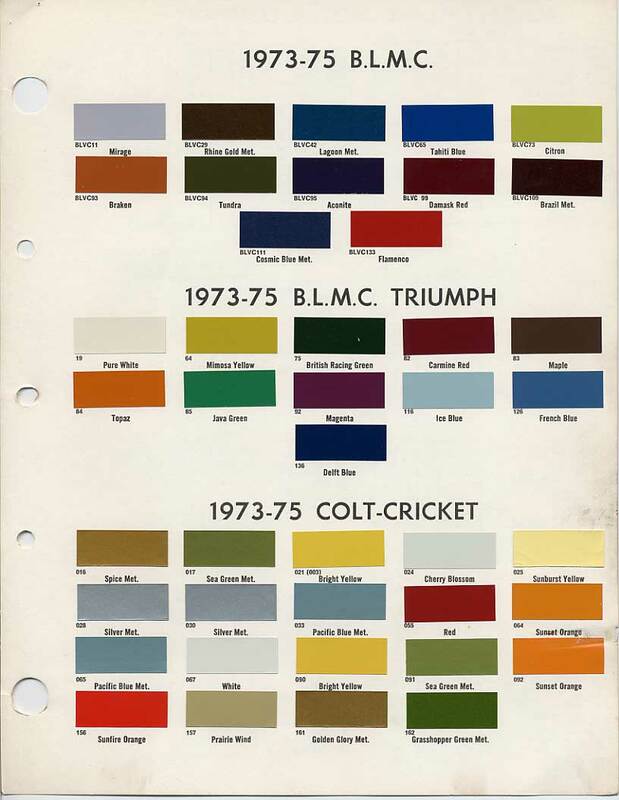 Note: Some British Leyland (BL) colours are listed under "Triumph" for the 1978 paint chips. 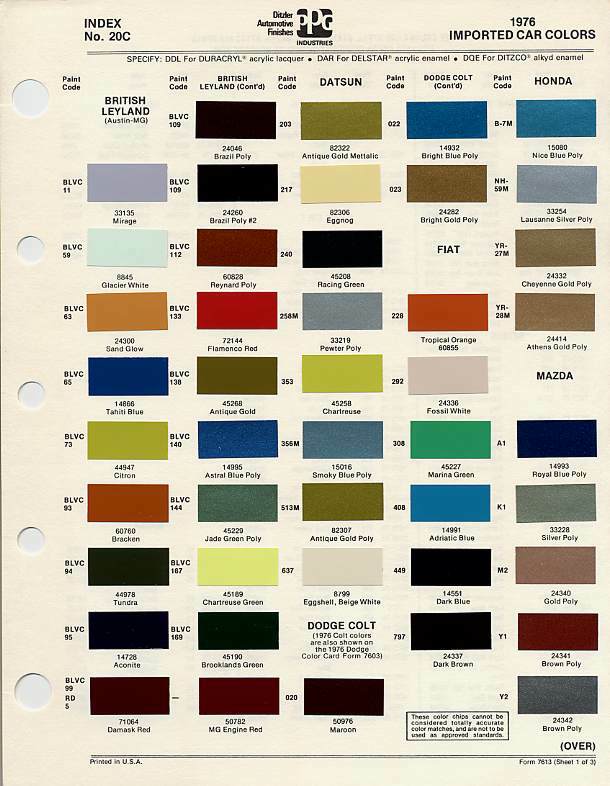 Make sure to have a look in the Registry to see photos of cars painted in the colors below! 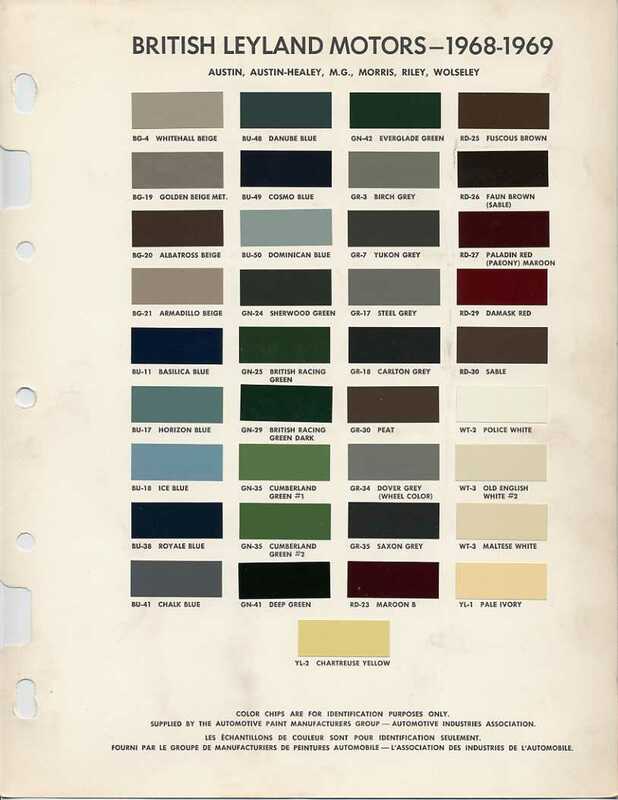 Ditzler Automotive Finishes, PPG Industries. Specify DDL for DURACRYL acrylic lacquer, DAR for DELSTAR acrylic enamel, DQE for DITZCO alkyd enamel. 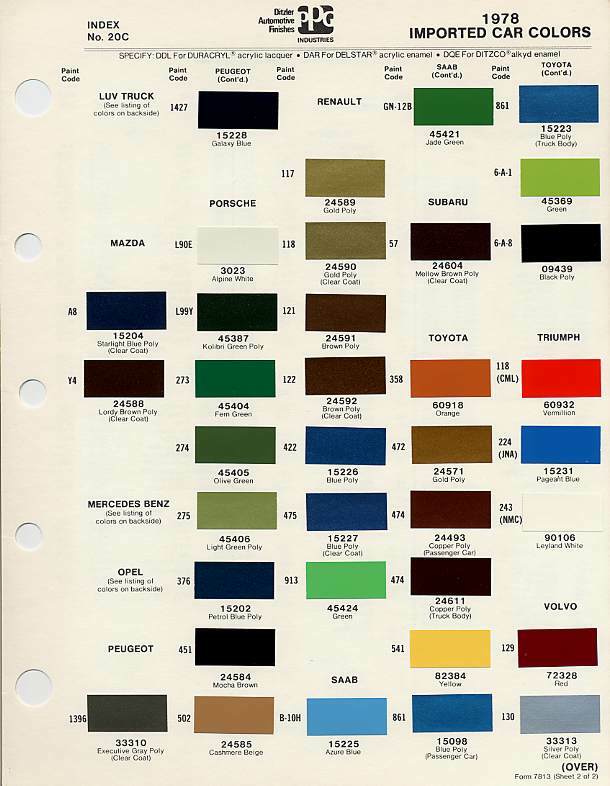 Comments on "BMC/BL Paint Codes and Colors"
I see that Indigo Blue is not on this list for 1968 Mk1 mgb its stamped on ID plate maybe its comes under another name? I have had the best luck using the PPG codes, which are marked "DITZ". Teal Blue was easily and well matched by my local shop. However, Snowberry White did come up in the system, but there is no formula listed. After calls to PPG, they found it under "Rover", but it's only available in a two-stage formulation, which won't work for my engine bay touch-up needs. remember it being pale yellow, not the chartreuse colour we would think of today. wished I still had that little car also. were very nice, certainly different than the 70s palette and from today's car colours too. hi, can anyone tell me on a 1968 morris mini what is "malmo green" stamped on id plate with as shown here 1/malmo green3 does not appear in the above lists at all ??? LOL - wish I had seen this last week. I went on an internet search to find paint codes [lucked out] for my '80 Spitfire. I needed a rattle can of touch up paint for its Pageant Blue exterior. As you noted it's the same as other BL products, in my case, a Jaguar color came up on the Carquest computer. When I bought my new '69 B, Snowberry White WT4 was the only white, not Old English White WT3 - which I like better. I have a Morris Minivan 1972 model. It's dark green but it's problem to find the paint code? Whitch colours was used in 1972? Is it odd that there is no black for the mid sixties cars?? My 74 and a half GT is Damask Red. It is neither according to '64-'67, '68-'69 or. '73-'75. Somewhere in between. Bought a can of touch-up damask Red from Moss and it's like '73-'75. Can't use it. Will see when a re-spray is due. I have a 1961 sprite that looks like signal red. do you have a chip chart for pre 64? 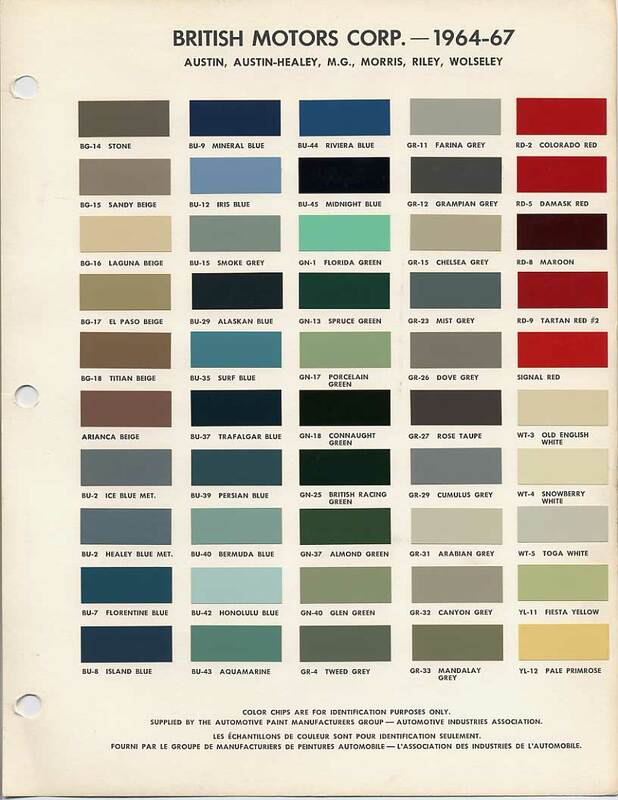 Is "signal red" a color that has the same mix across the decades? Or does it have some numbers associated with it? The codes are not listed for the bright yellow 90 under the 1973-1975 Crickett. can you give me those codes please? I had my 1972 USA MGB resprayed in 1986 from Bronze Yellow to Thriumph Mimosa Yellow. After consulting a few years later with a professional paint shop owner for a bit of spare paint he came up with two different color mixtures, one of which was indeed used on my MG respray. So I wonder how often this variance in mixing schemes is present, this color overview makes no mention of this. Still an excellent overview for us all.